The journal Tropical Oceanography (Trop. Oceanogr. abbreviation) provides open access to articles published through its web site. Currently, the journal has more than 500 published articles available for free download. Manuscripts must be submitted electronically (“New submission”) and Guidelines for Authors must be strictly followed. The members of the Editorial Board act as scientific editors of submitted papers related to their field of expertise, evaluating critically the scientific merits of the manuscripts. 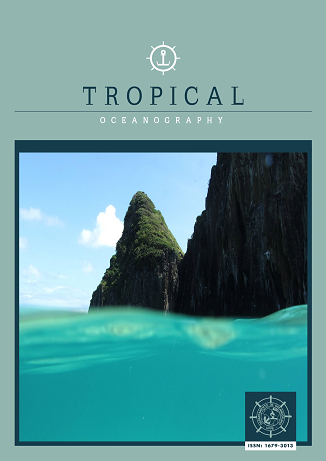 To contact Editor-in-chief, please send an email to contato.tropicaloceanography@gmail.com. Until 2001 only the printed edition existed (ISBN: 1679-3005) then the journal has changed to online edition (ISSN: 1679- 3013) in order to share knowledge and achieve international ranking, for both journal and authors. Since the first issue of volume 33 (in 2005), the printed edition was suppressed, but all former published articles may be freely accessed.